The Guiana Space Centre (CSG) is located in French Guiana, a French overseas department. It lies on the Atlantic coast of the Northern part of South America, close to the equator, between the latitudes of 2° and of 6° North at the longitude of 50° West. The European spaceport is located between the two towns of Kourou and Sinnamary and is operational since 1968. The CSG is governed under an agreement between France and the European Space Agency and is managed by the French National Space Agency (Centre National d’Etudes Spatiales – CNES) on behalf of the European Space Agency. 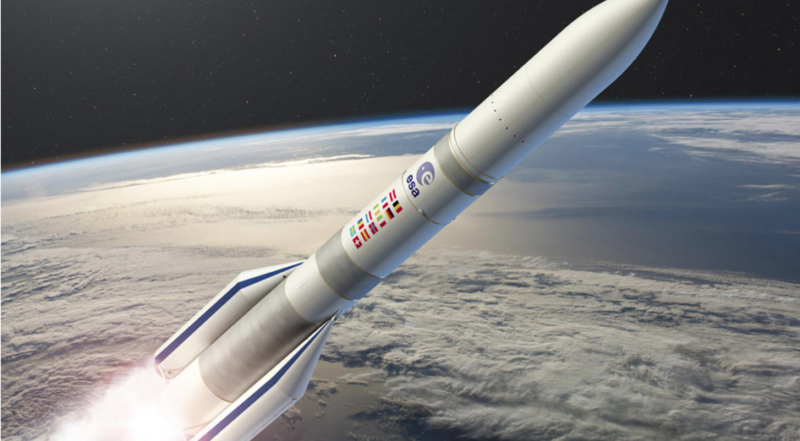 The proposed mission will launch in late November 2032 on Ariane 62 for delivery to Venus. Following orbit insertion and periapsis walk-down in 2034, orbit circularisation will be achieved by aerobraking over a period of several months, with the main mission phase starting around end 2035. Various trade-offs on the transfer options were performed for the ESTEC Phase 0 / CDF study ending in fall 2018, to allow more margin on the spacecraft mass, which was particularly constraining following a first assessment of the M5 proposal. 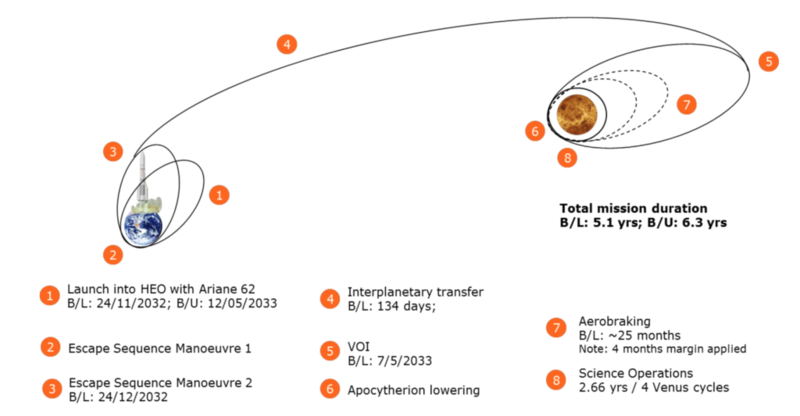 Our baseline launch in November 2032 encompasses a comparably short transfer duration. A launch in HEO (High Earth Orbit) followed by two escape manoeuvres gives more flexibility with available launch mass of 2870kg. In order to have a feasible mission, this HEO launch strategy – about 100,000 km apogee, nearly a third of the Earth-Moon distance – is considered as baseline, with the drawback of having a time-critical escape manoeuvre that adds a risk to be further managed at study and project level. Launch in High-Earth Orbit (HEO) in November 2032, transfer and orbital insertion manoeuvers (after final CDF study in Dec. 2018).A backup launch is in May 2033 and is significantly longer due to an Earth swing-by. 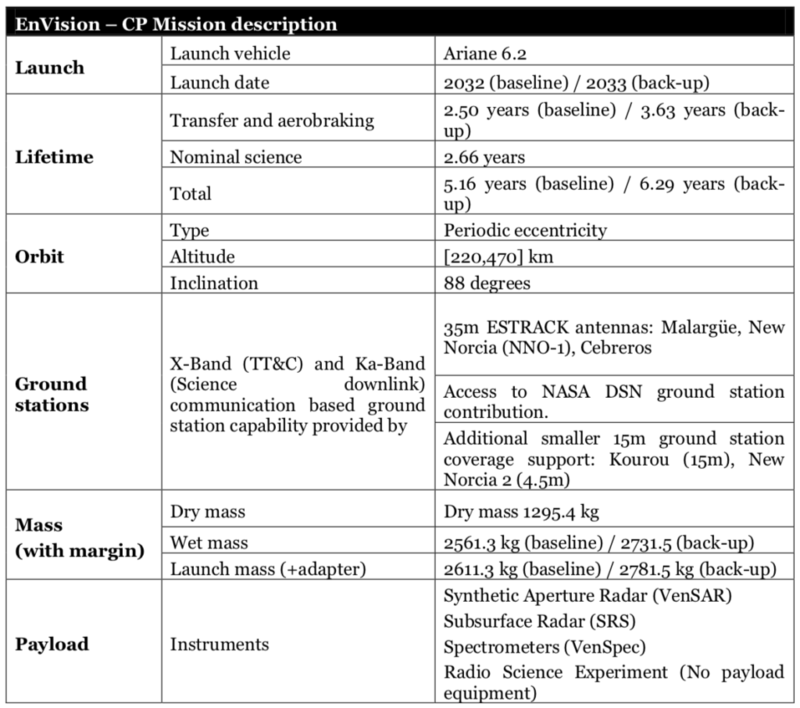 Both launch options are compatible with the programmatic mission aspects and are both feasible in terms of mass budget. One of the main trade-offs involved revisiting the operational orbit options between quasi-circular, periodic eccentricity, highly elliptical. The selected science orbit is a quasi-polar slightly elliptical low Venus orbit. Its Apocytherion and Pericytherion are evolving in the [220, 470] km altitude range. Its specificity is that it has a periodic eccentricity. This means that the eccentricity vector, describing the eccentricity and argument of pericentre, evolves in time, but the initial value is such that at the end of the cycle it is back to its initial point. This characteristic enables cycle-to-cycle InSAR measurements, which require that the repeat and the reference orbits are such that the angular separation between the spacecraft positions at the acquisitions of two SAR images of a given InSAR pair, as seen by any point imaged on the surface of Venus within the targeted Regions of Interest, remains smaller than the critical angular baseline or 1.4 deg (this includes the maximum frequency shift capability of the SAR to compensate for spectral baseline shift), provided this viewing angle is known better than 0.5 mrad. From a nominal frozen eccentricity ~250 km altitude elliptical orbit, the imaging radar will operate in three different modes across four cycles. Each four-orbit sequence will consist of one stereo pair stripmap; two interferometric pass-to-pass stripmaps; and a targeted acquisition of high resolution multipolar images. The imaging strategy permits collection of nested image data products: SAR imagery at 30 m resolution of the 20% of the planet, repeated interferometric pairs and multi-polarimetric imagery, for change detection and surface material mapping, over this same 20%, and high resolution (<5 m) imaging of approximately 2% of the planet’s surface. 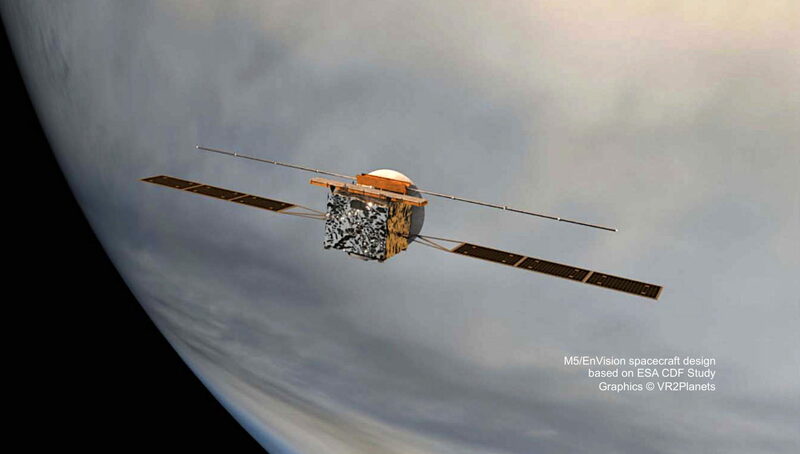 Core mission instruments will also provide subsurface sounder profiles, and global infrared emissivity mapping from nightside observations and spectroscopic data to identify key volcanic gases. Chemical, electric and hybrid propulsion options were assessed, even if the hybrid ones were discarded early on in the study, due to added complexity and mass. In order to compare the two options (chemical and electric), they were selected to be assessed as system options. The electric propulsion option would see a transfer, Venus orbit insertion and science orbit acquisition with the electrical thrusters, while the station keeping and AOCS would be executed with monopropellant. The chemical propulsion option has every manoeuvre done through a bi-propellant system and uses aerobraking for the science orbit acquisition. 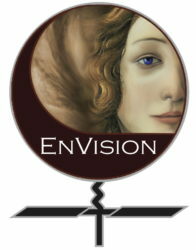 The EnVision mission description in the chemical propulsion option (CP). The chemical propulsion option has every manoeuvre done through a bi-propellant system and uses aerobraking for the science orbit acquisition. Launch, lifetime, orbit, ground stations, mass (with margins) were assessed during the Concurrent Design Facility (CDF) study ending in Dec. 2018.